When the neo-cons in the UK parliament and the serial warmonger Hillary Clinton call for a “no-fly zone” they actually mean the opposite. They mean that NATO should be given untrammelled access to the [Syrian] airspace to carry out mass bombings – but that nobody else [including the Syrian government] should. We saw it in Libya. The argument goes like this. NATO aircraft need to enforce the no-fly zone. To do this in safety, they need to attack and destroy any ground-to-air weapons capabilities on the ground. That does not just include surface-to-air missiles, both carriage mounted and hand held, but anything that can be pointed upwards and fired. They need to take out by more bombing any stores that may house such weapons. They need to take out any radar installations, including civilian ones, that may pinpoint NATO aircraft. They need to destroy any runways and hangars, including civilian ones. They need to destroy by bombing all military command and control centres, including those in built-up areas. They need to destroy the infrastructure on which air defence relies, including electricity generation and water supply, including civilian assets. I am not exaggerating. That really is the doctrine of NATO for enforcing a “no-fly zone”, as previously witnessed in Iraq and Libya. 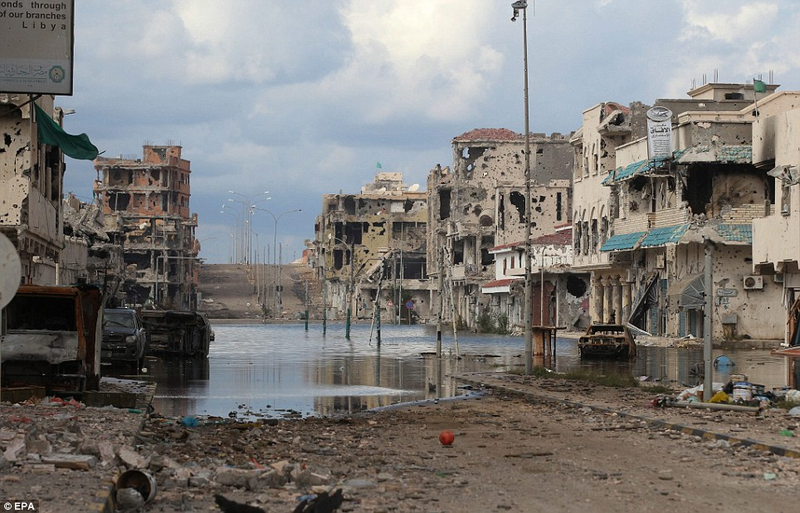 It really was NATO aircraft which did to the beautiful Mediterranean town of Sirte the destruction which you see in that picture – in order to enforce a no-fly zone. Enforcement of the no-fly zone was the only authorisation NATO had for the massive bombing campaign on Libya which enabled regime change, which enabled rival jihadist militias to take over the country. They showed their gratitude by murdering the US Ambassador. The failure of central government led to Libya becoming the operating site from which a number now in the hundreds of thousands of boat refugees have crossed to Europe. A security council resolution could be tabled calling for the end of all military flights, by anybody, over Syrian airspace. The UK and US would oppose that, and so would all those Tories and Blairites pretending to advocate a no-fly zone in the House of Commons. That would show up the bastards for the evil hypocrites they are. I asked what purpose this media campaign [pumping a no-fly-zone] may have. It now seems clear that it is part of preparing the European public for all-out war on Syria, its government and its people. The Guardian editors use the created migrant crisis to demand that “something” be done. They ridiculously first remind us that the false “no-fly-zone” campaign against Libya ended in a country ripped apart and more refugees only to then demand a similar campaign in Syria. Saner British voices remind us that “western” meddling in the Middle East is the source, not the solution for the current catastrophes. Ministers will start to make a case for British military action in Syria next week — with Downing Street keen to take the “next step” against so-called Islamic State — the BBC understands. CLINTON: We should also work with the coalition and the neighbors to impose no-fly zones that will stop Assad from slaughtering civilians and the opposition from the air. Opposition forces on the ground, with material support from the coalition, could then help create safe areas where Syrians could remain in the country, rather than fleeing toward Europe. QUESTION: Madam Secretary. Hi. Back to the no-fly zone. are you advocating a no-fly zone over the entire country or a partial no-fly zone over an enclave where refugees might find a safe haven? And in the event of either, do you foresee see you might be potentially provoking the Russians?